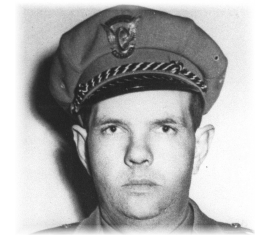 Sergeant Rosette was killed in a traffic accident while on a prisoner extradition in Utah. The 45-year-old victim and Mesa County (Colorado) Sheriff E.E. Redmon were traveling to Price to pick up a prisoner. Sergeant Rosette was a passenger in the Mesa County police vehicle. At the incident location, a large eastbound truck paused to allow the officers’ vehicle to pass before making a left turn. The truck was struck from behind by a semi tractor-trailer. The collision forced the first truck into the path of the oncoming police vehicle. Sergeant Rosette suffered blunt force trauma to his chest and was killed instantly. Sheriff Redmon suffered critical injuries but survived. An inquest conducted two weeks later found the driver of the semi truck negligent. Sergeant Rosette is buried in Colorado. His bronze name plaque is sponsored by the Utah Highway Patrol Association.